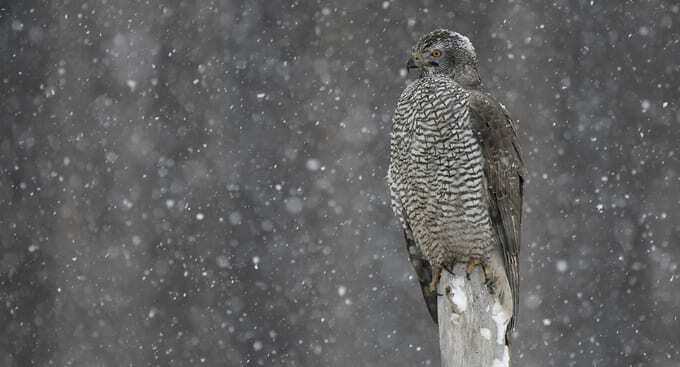 The smouldering umber of a watchful eye in the deep forest gloom, a grey phantom flitting from tree to tree, the goshawk is an elusive raptor, cloaked in mystery. Superstition shrouds this magnificent hawk and in the Middle Ages people nailed dead raptors to their doors to ward off witches and evil spirits. It was supposed that if the feathers of a goshawk were used in the making of a down bedspread, a sick person who slept in it would linger in a state close to death, unable to pass over, for long periods of time. Goshawks commanded a great respect in these times and people avoided uttering their name for fear of attracting hardship and death. The Latin name Accipiter gentilis translates to ‘noble raptor’, and indeed the birds have rubbed feathers with gentility; nineteenth century gentlemen would hawk with them when the sport was popular, and goshawks have a folkloric kinship with kings, heroes and noblemen. Hawks and nobility are married in Welsh tradition and in the Mabinogion, Pwyll Prince of Dyfed offers gifts of horses, hounds and hawks to the King of Annwn (the Otherworld). Whilst goshawks symbolise courtliness, heroism and bravery in both British and Norse mythology, they served a humbler purpose in the Middle Ages. While gentlemen hunted with peregrine falcons, yeomen favoured goshawks due to their prowess for hunting and they aided the farmers in fattening the larder with a steady stream of hare, rabbit, and game birds. The French called the goshawk the cuisinier, the cook. Sadly, the goshawks superlative hunting skills led to their persecution, they were seen as a threat to game birds and poultry during the 19th century and hunted to extinction in the UK. Persecution continues, so breeding pairs are unlikely to settle in farmland or areas managed for game. Although goshawks do hunt game, two thirds of their diet consists of woodpigeons, crows, rooks and rabbits. Goshawks need dense woodland to feed and to nest; they make up to 70% of their kills in woodland areas, and return to their nesting sights year after year if they remain undisturbed. Deforestation in the 19th century aided their extinction, and habitat loss continues to contribute to their scarcity, as woodland decreases or fragments. Goshawks mate for life and there are an estimated 300-500 breeding pairs in the UK, and their suitability for reintroduction is demonstrated through the hawks’ reinstatement in the 1960’s and 70’s. Hawk keepers and falconers brought goshawks to the UK from Europe, and escaped or deliberately released birds established populations throughout the country. Goshawks are the ghosts of the forest, seldom seen, sleuth-like shadows, unlikely to be spotted by the casual observer. They are a large species at 55-61cm long, generally dark blue-grey in colour with barred grey and white undercarriage and under-tail coverts. Their upper tail is barred black or brown. Adults have a white eyebrow and they are distinctive for their eyes, which are yellow in juveniles, deepening to red or orange in adults. They have broad, short wings, and a long tail, enabling their adept hunting skills and allowing them to manoeuvre spectacularly in mid-flight, catching prey in their talons, undercutting them from beneath and seamlessly changing direction as they swoop between trees in their pursuit. They will even stalk their prey on foot. The best time to spot them is during late winter and spring, when they break cover for their ‘sky-dance’ display, during which females and males swoop and plunge in a dramatic dance of courtship. A thrilling sight, restoration of the goshawk to Wales would return this ancient dance to our lands, a spectacle staged in the wild winds and wide skies of the Cambrian Mountains.